Hello friends! I hope you are enjoying this wonderful fall season! Today I have a fall card to share with you. 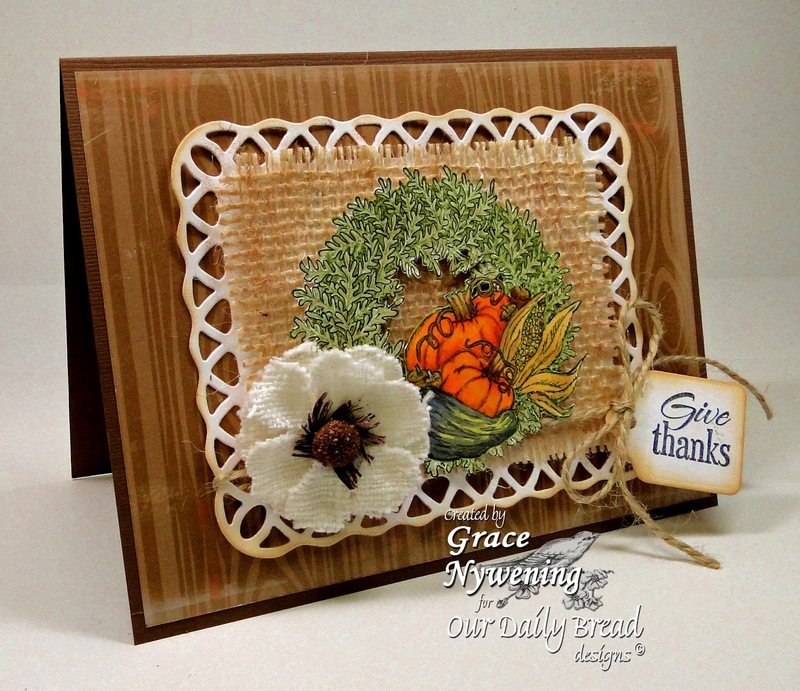 I created this card with this month's Our Daily Bread designs release, Pumpkin Wreath and Apple Wreath. I started with a Bazzill base, added the wood grain Recollections designer paper, and stamped my image on Flourishes White card stock with Memento ink. I colored it with Copics and fussy cut it out, then mounted it on a scrap of burlap that I adhered to a white layer cut with the Spellbinders Lattice Frame. The little sentiment tag is cut with Spellbinders Back to Basics Tag set, and the sentiment is from the Apple Wreath set. Some twine and a Prima burlap flower finished off the country feel of this card. I hope you enjoyed it! We are enjoying some special R&R time so I'm not doing a lot of blogging right now... but will be back soon! Nice to know you are taking time to breath and refresh yourself, Grace. This is beautiful - love all the texture and the rustic feel it has. What a beautiful card Grace!! I just love all the texture you added with the twine, burlap, and burlap flower. Gorgeous fall card!! Miss you gf!! Gorgeous card, Grace! Love the wreath and all the beautiful details! Enjoy your R&R time! Grace this is gorgeous. I love fall images. Hope you are enjoying your week. ohhh!! I really love this card Grace. it is so beautiful and that flower is gorgeous. Perfect for the card. lovely colouring. terrific country feel, the wood background and burlap for the background to the wreath is great touch!